Again, the day everything changed. Happy anniversary, m’luv. Only one more year until we can celebrate by giving each other foil. A couple of email messages and a post I found on another site recently have clued me in to the fact that a lot of people seem to think I’ve moved to Pittsburgh. I guess I can see how the casual observer might come to this conclusion, what with my (relatively) new job, the fact that we own a house in Da Burgh, the fact that we’re trying to sell the house in Winston, the hubby‘s recent abandonement of San Francisco, etc. But the reality is that I still very much live in the Triad. Full-time, even. The reason we’re selling the house is to eliminate the thirty-mile commute to Greensboro that we both now face on a daily basis. Again, we do still have a house in Pittsburgh. Mark has done wonderful things with it. And I visited it this weekend for the first time in almost five months. It’s a nice house in a nice city. It’s just not where I live. I wanted to make that clear, since geography is inordinately important to me. The whole insomnia thing has been getting much better of late, but last night was a big exception. A combination of factors kept me up most of the night, the aforementioned factors ranging from a really exhausting quick weekend trip to Pittsburgh to multiple work deadlines to some personal stuff. I’d prefer to have skipped the whole sleepless night, but since I was up anyway, I went ahead and drove into work really early and found that (1) the traffic was quite light at that predawn hour and (2) I was surprisingly productive once I got to work. But it’s only 11:30 now and I’m already beat. Plus I have two more meetings to go today. I’ll update you if I care enough to bother by the end of the day. Hooray for random optimistic 1970s pop songs. I have a Giant Eagle Advantage Card because I’m in Pittsburgh a few times a year. Like most of my other supermarket cards from around the country (yes, I have a lot of them), it’s registered under my Winston-Salem address. There’s not a Giant Eagle within about four hundred miles of here. You’d think their mailing list database software would recognize that based on my zip code and that I probably wouldn’t get postcards in the mail inviting me a to a one-day seafood sale on Saturday. You’d be wrong. I had some sad and unexpected news yesterday. Someone I’ve never met and wouldn’t recognize if he walked into the room right now is terminally ill and may not be around this time next week. Let me explain. This person was one of my freelance clients. Although we’d been working together off and on for the better part of a decade, and even lived in the same town at one point, we’d never actually met in person. In fact, we’d only talked on the phone probably fewer than a dozen times. Even so, I felt we sort of “knew” each other. He seemed like a really nice guy and we got a long pretty well in a virtual sense. He even wrote one of my recommendation letters for graduate school. There was a time ten or twelve years ago when a fairly high proportion of my friendships was virtual as well. I often used to spend a couple of hours a day in correspondence with several people around the world that I’d never met but still felt very close to. In those days, online worked really well for me, because then (as now) I’m often uncomfortable talking on the phone. But I don’t really socialize very much online anymore–nor in person, as it happens, but that’s a story for another day. I don’t really engage in deep correspondence and I’ve whittled my Facebook feed down to about five “real life” friends I’ve known for years. And even then, I check in only sporadically. Maybe I was just ahead of the curve with respect to online friendships and work relationships. But when you lose a “virtual” friend or coworker, it’s still sad, which says a lot about how different human interaction is now than it was, say, twenty years ago. 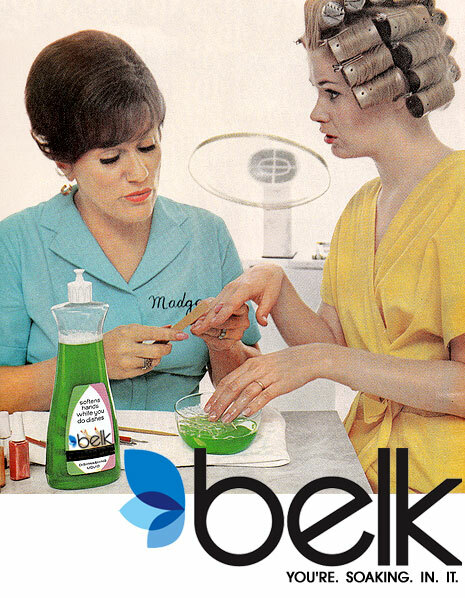 Belk used to refer to its old logo as the “Big B” back when it was first unveiled in the late 1960s. The old logo was actually the first logo ever adopted by the company chain-wide, thanks to its loose corporate structure. And it was one of the first things I learned how to draw. The new logo, alas, looks cheap and tacky. It is in no way big, attractive, nor anything that I would ever want to draw. It will not, however, stop me from shopping at Belk. I stopped doing that years ago when I gave up malls in general. I’m a little baffled as to how (or why) you would use an RSS feed of your email inbox. It would seem that you would have to be logged into your email for the feed to display in the first place (or at least I hope you would), so what exactly is the point? I’m a little pissed off about RSS feeds in general today, but that’s a subject for another rant I don’t have time to write at the moment.